I had been drawn to Machu Picchu for years but for some reason, had never managed to get there. Machu Picchu is cited as one of the new Seven Wonders of the World, and is often referred to as ‘The Lost City of the Inca.’ A mountain rising to just under eight thousand feet above sea level, covered in 15th Century Inca ruins, it surely is a sight to behold, and breathtaking in more ways than one. As so often happens when one is on a spiritual path, as soon as I admitted defeat and stopped trying to find my path, it found me. For during my visit to Machu Picchu, quite unexpectedly, I received a powerful and mystical vision which was to change my life forever. I had climbed to the highest point at Machu Picchu to see the Intihuatana stone – also known as the “hitching post of the Sun.” I was feeling frustrated as I had only caught the last two minutes of a talk about the stone, and the crowd was being shown out of the area down some steep and crumbling steps. I was the last to leave the enclosure, and as I cautiously made my way down the ancient steps, something red caught my eye. Startled, I looked up and saw that I was surrounded by about twenty Inca, all staring intently at me, red cloaks blowing in the strong valley winds, with feathered helmets on their heads and what appeared to be spears in their hands. Having previously enjoyed a trip to Rome that same year, and seen locals dressed up as gladiators and centurions posing for photos outside the Coliseum, I assumed that the Inca before me were a similar sort of tourist attraction, which to be honest I was a little upset about. But as I was able to focus my attention more fully onto them, I noticed that they were fading in and out, as if they were being tuned out on an old fashioned television. I stopped dead in my tracks right there on the steps. I looked around to see if anyone else was close by, and amazingly, given the 400 visitors a day who visit Machu Picchu, no one was around. I could just make out a friend sitting against a rock on the distance but that was it. Fearing my knees would fail me, I wobbled my way to the bottom of the stairs. An Inca was stood a short distance away from me, but he was dressed differently to the rest. Apart from a slit in his helmet exposing his deep black eyes, he was completely covered in golden armour. And he was immensely powerful, so powerful that I could barely stand in front of him. I kept subtly pinching myself to make sure I was not dreaming, but there was no doubt he was there, right in front of me and I was wide awake. I will admit it, I was pretty terrified, but something in me knew that I must maintain eye contact with him. The charge from his eyes was so strong that when his gaze met mine, a blue ball of electricity formed equidistant between us which crackled and sparked in mid-air. Tears flowed from my eyes and my knees shook, but I maintained my stance at what I hoped was a respectful distance. He then pointed to another Inca on the plateau below us, and indicated I was to go to him. Again, this Inca was powerful but dressed more traditionally. I stood in front of him, again having no idea what to do and was pretty alarmed when he made a grab for my throat! He wrestled something out of me, threw it into the wind and then indicated I could leave down some uneven steps down the side of the mountain. A sharp stone dug into the underside of my foot and when I looked down at it I saw that instead of my sturdy walking boots, I had on a pair of black leather Inca boots wrapped around my feet. This stunned me and I realised it was a sign I had been here before. The winds rushed up from the river valley below and plastered me against the side of the mountain. I could barely catch my breath. But then suddenly the wind died down and I heard a voice saying I could go now, and that was it! I was completely dazed, but it was a truly amazing experience and I will never forget it as long as I live. Dawn Paul was born in 1965 in Nottingham, England. At around the age of three she realised three things, one, that she was hugely fascinated by people’s minds, two, that she was not from here, and three, that she had a lot of questions! Dawn struggled to find her place in the world, feeling hugely drawn to all things spiritual, but ending up working in financial services for 20 years despite the fact that she felt constantly pushed to do something – but she did not know what that was. Eventually, after years of searching she felt that she had no option but to give up. Exhausted from her search and the constant challenges she had faced in her life, she found herself at Machu Picchu, Peru. There, she received a mystical vision and was told to follow the path of the shaman, and then everything became much clearer! Waving goodbye to her six figure salary, Dawn stepped onto the path of the shaman, where she had always belonged. 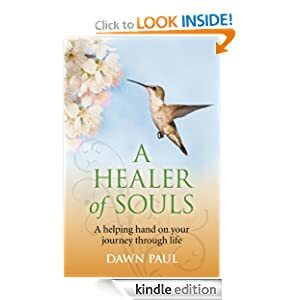 She now works worldwide as a shamanic healer and spiritual teacher, and her book, A Healer of Souls – A helping hand on your journey through life, is her gift to the community, without which a shaman cannot exist.